SFC Johnson treating a wounded patient. 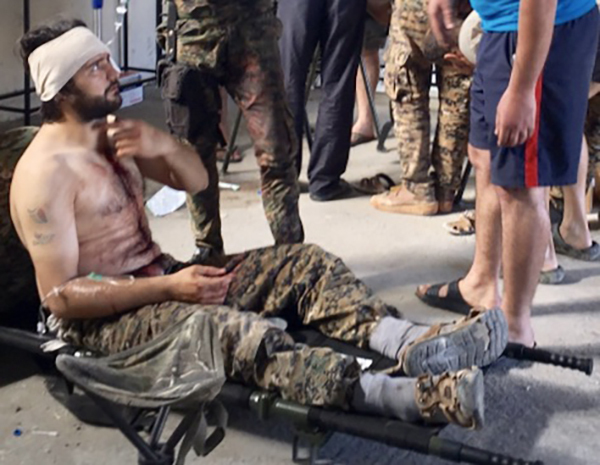 This is the fourth report in our Syria four-part series this summer and this one focuses on a US Army Special forces medic who saved many lives during the fight against ISIS. We first met him during the push across the Euphrates River in 2016 and were impressed by his care, expertise, humility and believe this is just one example of the good US Forces were and are doing in Syria. Not only do the US forces there save lives, they help to stop and defeat ISIS and create spaces where Kurds and Arabs of different factions can find common ground and a new way in Syria. Below is a brief story of our first meeting with Special Forces Sergeant First Class (SFC) Jonathan Johnson, followed by his own story of serving in Syria. While Karen and the kids were in Kobane to do a kids program and interview victims of ISIS attacks and occupation, Eliya, our FBR medic from Burma, and I went west to the new front lines, crossing the Euphrates River to learn the situation at the front. As Eliya and I crossed the river, we were asked by the people there to respond to a mass casualty situation: a group of civilians had been badly wounded by an ISIS land-mine/ IED. An American Special Forces medic was already taking care of the casualties and Eliya went to work with him and other volunteer medics, trying to keep the wounded alive. The Special Forces medic was not only caring, highly skilled and humble, he also had the ability to organize all of us to best help. He reminded me of a conductor of an orchestra, a life saving one. His name was Jonathan Johnson. There were patients with brain trauma, sucking chest wounds, internal injuries, broken limbs, shattered arms and jagged flesh wounds. One little girl of about five years had been hit in the head, chest and extremities. She had a brain injury, and serious internal injuries and bleeding. SFC Johnson, Eliya and others of us worked to save her life. SFC Johnson was outstanding as he attended to the most severely wounded, dividing his duties with Eliya and delegating duties to the rest of us. His competency, coolness under pressure and humility was life-saving for the victims and enabled all of us there to be put to maximal use. This was one of the many acts of service I have seen American soldiers do and is what the world needs to know about. There are children and families being injured and killed every day here and without the help of this medic and the other Special Forces here, many more would be dead. As we helped the medics treat and stabilize the patients and as I prayed for them one by one, I could see how great the need was for more medical help along the front lines. A mother of one of the children who was severely injured was herself in shock. When we gave her a bottle of water to drink, she put it up to her cheek, missed her mouth and dribbled the water down her chin, all with a terrified and bewildered look on her face. Her child was near death and there was nothing she could do. I prayed with each patient and all who were conscious looked at me intently. As our eyes met and some smiled back, I hoped each person felt the love of Jesus. After the patients were stabilized and evacuated back to Kobane, Eliya and I continued west to the front area to another casualty collection point. ISIS was being pushed back towards Manbij and coalition aircraft were providing air support. SFC Johnson kept saving lives. A wounded soldier in the field hospital. I want to start by saying how much I appreciate all that FBR and the Eubank family do for mankind. They are the bright light that shines in the dark places of the world. I am humbled that Dave asked me to share one of my own stories as he and so many other members of FBR have done so much more than I could ever dream of doing. 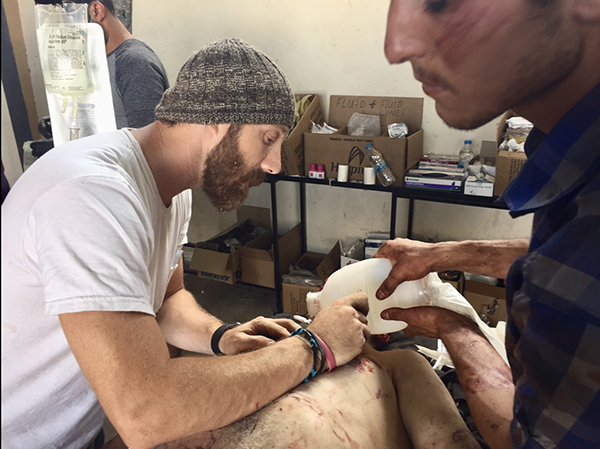 Shortly after my serendipitous meeting with Dave I moved to a new location in northern Syria and continued to run a field hospital. 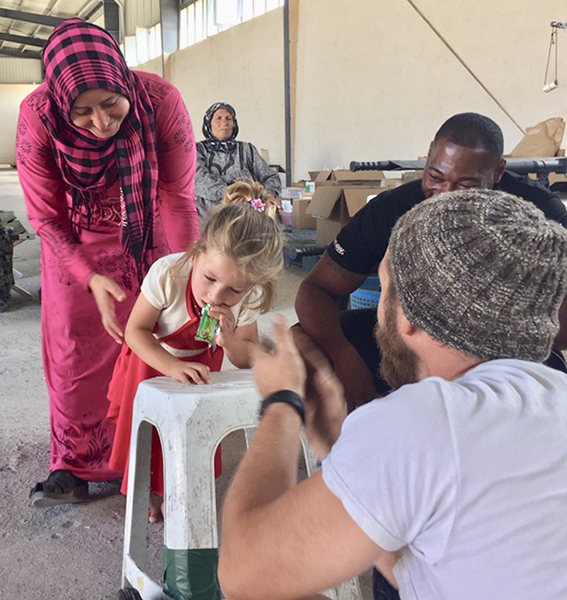 One of the core tenets of every field hospital I have established is that everyone receives equal treatment regardless of social stature, ethnicity, or any other distinguishing factors. I believe this tenet is essential for all parties involved to understand and support what the Hippocratic Oath and the Special Forces motto stand for, yet it is seldom easy to employ this tenet in places riddled with factions of evildoers and disenfranchised populations suffering from oppression and infighting. Sticking to it is taxing on personnel, equipment, and time; but, when employed, I have found it spreads like wildfire and can begin the true healing of a nation. Without it I would simply be attempting to put Band-Aids on bullet wounds. Eliya, a Karen FBR medic, and SFC Johnson work on a young patient. By this time, the reputation of our team’s determination to help everyone with medical care had spread far and wide, though the details of our capabilities had been inflated to a level much greater than they actually were. I took this as a badge of honor but also as a reminder of the importance of remaining humble and honest; the people you care for will always appreciate honesty more than appeasement. I faced this exact situation when I met Sanaa. It was around three in the afternoon when I first got word that a young girl had arrived at the gate with her family. In all honesty, I suspect she reached the gates long before. As I alluded to previously, healing the wounds of a broken nation is a slow and difficult process and not everyone’s wounds heal at the same rate. This commonly manifested in reluctance among the local guards to inform me of non-combatants’ arrivals to the gate – a reluctance motivated by a mixture of distrust and a misguided attempt to protect me from spending too much time on anything other than the casualties coming in from the front lines. In the end, their hearts always softened and, out of a mixture of compassion, respect, and desire to avoid a passionate lambasting from me, the guards would send someone down to inform me of the patient’s arrival. Such was the case with Sanaa. My Arabic skills, though reasonable, are not in the Levantine dialect and my Kurdish skills are abysmal. To further complicate things, our initial brief of her condition was cut short by the arrival of the day’s first wave of casualties from the front lines. It was a struggle to understand their explanation of Sanaa’s condition so finally I said, “Please, just bring her in,” also asking that she be allotted only one chaperone to avoid overcrowding caused by the current patient load and the inevitable second wave of casualties that would arrive anytime now. Of course, that was not what happened. Instead, the mother, the grandmother, an aunt and the grandfather came in, bearing the cutest and happiest little girl I had seen in Syria. “Sanaa” means radiance and the joy and aura that beamed from her proved that she was as aptly named as anyone I have ever met. As welcoming as her face and eyes were, she was quite shy and slow to speak but when she did, it was endearing. As they arrived I took a quick second to greet the grandfather and mother and say hello to Sanaa, explaining that I was busy with patients from the battlefield but would do my best to take a look at her between critical patients. I gave them my usual reminder that while they are a priority they are not always going to be the main priority due to often more pressing matters that come up in the hospital. I returned to some other patients to wrap up with them, got them loaded onto their respective ambulances and, during a lull in new patient arrivals, had time to take a look at Sanaa more thoroughly. Although I am well-trained and I do my best to expand my skills, I am not a doctor by any measure. My assessment of her illness is likely not 100% accurate, but I believe that she likely suffered from Spastic Cerebral Palsy or a similar ailment. Her legs were rigid and all the muscles were so stiffened that she had minimal control of her muscle movements. She had never walked, in spite of being somewhere between three and six years old (my ability to estimate children’s ages has never been great and it’s even more difficult in countries that are in a civil/revolutionary war and have minimal means of nourishing their children). After completing a physical exam, testing motor skills and reflexes, and talking with some nearby physicians, I sat her family down and did my best to convey the sad truth that there was not much I could do for her in terms of treatment. It was difficult, but I felt it important that the family understood that while I would do everything I could, her condition was well outside of my skill and scope to provide treatment, and I wasn’t even qualified to make the definitive diagnosis. But somehow I wasn’t willing to let that be the end of it: her family had walked days to find us and had respectfully and calmly waited both at the gate and inside the field hospital. I felt that I needed to do something for this precious girl, but what? I thought about it for a short while and then had one of those wonderful “Aha” moments that are rare for me but I thoroughly enjoy when they happen. I asked one of the guys with us to bring me a plastic footstool we had been using as a seat in the aid station. I ran over to the wheeled trashcan outside and removed the wheels with their small metal axel. Then a few guys and I got to work with a grinder and some duct tape and we fashioned a walker for her. It took quite a bit more convincing than I had expected to get her mother to approve of me helping her stand up and lean against the new contraption. Looking back, I imagine the reluctance was more of a protection mechanism and fear of getting hopes up to only be further saddened. Luckily, after some talks and tea, we were able to get Sanaa out of her mother’s arms and onto the floor of our aid station, leaning against the walker. Once there I could still see the doubt on the chaperone party’s faces and her mother was quite verbal about the fact that it wasn’t going to work. I was stubborn though and insisted that we try. I tried to keep Sanaa’s attention and get her to understand what it was I wanted her to do. I demonstrated the use of the walker and played with her for a little while but still no luck. Then a second “Aha” moment struck me and I went and got a candy bar that we had in the fridge. I opened it up, let her try a small piece, and then walked across the aid station and held it up for her. Within seconds, her smile grew even bigger than it already was and she began to scoot towards me. The joy that shone on the faces of her family as she began to move across our aid station was unforgettable and is massively rewarding to me even to this day. Seconds later she had walked her first steps and traveled quite a distance over to me, happily receiving her reward. By this time other patients were inbound and it was time to get back to work on the casualties from the front lines so we hugged and shook hands and Sanaa and her family disappeared back into the desolation of war-torn Syria. I hope that she is doing well now and that her family is safe and happy, but it is impossible to know for certain. Wherever she is and whatever happens, I hope that she and her family can look back on that day in the same way that I do and that they, too, will share the story of how people from starkly different backgrounds and cultural upbringings came together to share in the compassion that mankind has inside themselves. I know that I will share this story with my grandkids one day as I encourage them to grow and foster relationships with people of all walks and statures of life.